SAINT AUGUSTINE – The Crisp-Ellert Art Museum and Flagler College announce “Jiha Moon: Double Welcome, Most Everyone’s Mad Here” to kick off our 2018-2019 programming season. The exhibition will be on view from Sept. 1 through Oct.27. The artist will give an artist talk on Friday, Sept. 7 at 4 p.m. with an opening reception to follow from 5 to 8 p.m., in conjunction with September’s First Friday Art Walk. These events are free and open to the public. Based in Atlanta, Ga.,, Jiha Moon (b. 1973, Daegu, Korea) harvests cultural elements native to Korea, Japan, and China and unites them with Western elements to investigate the multi-faceted nature of our current global identity as influenced by popular culture, technology, racial perceptions, and folklore. 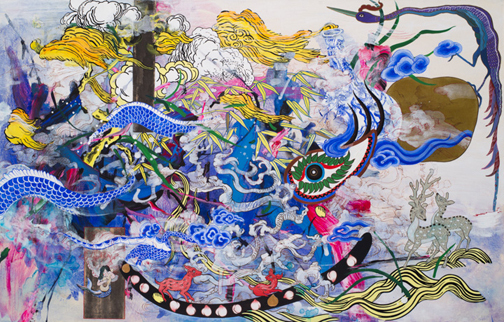 Featuring over fifty works including painting, ceramics, and installation, Moon blurs the lines between Western and Eastern identified iconography such as the characters from the online game Angry Birds© and smart phone Emojis which float alongside Asian tigers and Indian gods, in compositions that simultaneously appear both familiar and foreign. Honoring traditional Asian arts through her use of Hanji paper, Korean silk, and calligraphic brushstrokes, throughout the exhibition she plays with iconography and symbols that have been classified as “foreign” such as blue willow china patterns, fortune cookies (which originated in California but are identified as Chinese), Korean fans, and floating dragons and intermingles them with references to Pop and southern folk art. Her misshapen and whimsical ceramics reference southern folk art face jugs yet are painted in traditional Asian ceramic glazes and motifs. At first glance, Moon’s work appears as a mash-up of high-and-low brow cultural references. Upon further inspection, slyly ironic and humorous references emerge that are satirically filtered by the artist, who reminds us that our preconceived notion of “others” is not a true manifestation of actual identity. Moon received her Master of Fine Arts from the University of Iowa in Iowa City, Iowa and her Bachelor of Fine Arts from Korea University in Seoul, Korea. Her work is in the permanent collections of the Asia Society, NYC, NY; the High Museum of Art, Atlanta, GA; the Hirshhorn Museum and Sculpture Garden, Washington, DC; the Virginia Museum of Fine Arts, Richmond, VA; and the Hunter Museum of Art in Chattanooga, TN. Her work has been the subject of numerous solo exhibitions at venues nationwide, including the Mint Museum of Art in Charlotte, NC; the Cheekwood Botanical Garden and Museum of Art in Nashville, TN; and the Weatherspoon Museum of Art, Greensboro, NC. She has been the recipient of several residencies including Omi International Arts Center, Ghent, NY; the Headlands Center for the Arts, Sausalito, CA; the Fabric Workshop and Museum, Philadelphia, PA; and the MacDowell Colony, Peterborough, NH. In 2011, Moon was the recipient of a prestigious Joan Mitchell Foundation Painter and Sculpture grant. “Jiha Moon: Double Welcome, Most Everyone’s Mad Here” is organized by the Taubman Museum of Art in collaboration with the Halsey Institute of Contemporary Art, College of Charleston School of the Arts in Charleston, South Carolina. The exhibition is curated by Amy G. Moorefield, Deputy Director of Exhibitions and Collections at the Taubman Museum of Art and Mark Sloan, Director and Chief Curator of the Halsey Institute of Contemporary Art. The museum is open Monday through Friday, from 10 a.m. to 4 p.m. and Saturday, from 12 to 4 p.m. Please note that we will be closed for Labor Day on Monday, September 3. For further information about this exhibition, please contact contact Julie Dickover at 904-826-8530 or crispellert@flagler.edu. For general information about CEAM, our exhibitions or related programs, pleasewww.flagler.edu/crispellert.